LOCATION, LOCATION, LOCATION! Retreat to Winged Foot in the heart of Daphne, a beautiful new home community located on Hwy 64 between Hwy 13 and Pollard Ave. As you enter the Aria, the foyer leads to the fabulous open concept Living/Kitchen area featuring granite countertops, a deep stainless undermount sink, stainless appliances, a large pantry, an island that overlooks the family room. The master suite has a roomy master bathroom, granite tops with undermount double bowl vanity, separate shower, soaking tub and large walk-in closet. 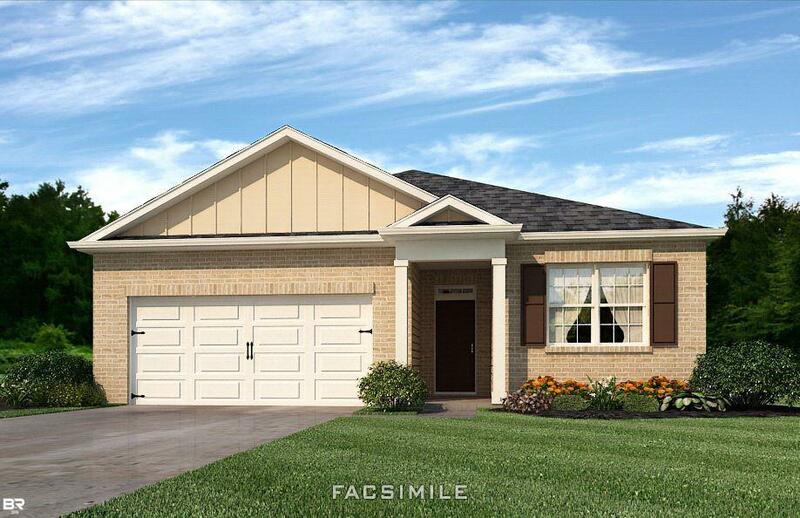 The second, third bedrooms are to the front of the home, with a second full bath. This home is being built to Gold FORTIFIED Homeâ¢ certification, which may save the buyer on their homeowner's insurance *(See Sales Representative for details.) **This home features our Home is Connected ? Smart Home Technology, which includes control panel, doorbell, smartcode lock, two smart light switches, and thermostat, all controlled by one app. (See Sales Representative for complete details on these smart home features.) *** Pictures are of similar home and not necessarily of subject property, including interior and exterior colors, options, and finishes. Neighborhood amenities include resort style pool, two lakes. $3000 in closing cost with preferred lender. Buyer/Agent to verify measurements. Bedroom 2 Dimensions: 10&apos;8" X 11&apos;9"
Bedroom 3 Dimensions: 10&apos;8" X 11&apos;9"
Dining Dimensions: 15&apos;1" X 12&apos;1"
Directions: From Hwy 98 Take Cr 64 East Approximately 2 Miles, Subdivision Is On The Left Next To The Dog Ranch. From Cr 13 And Cr 64 Go West On Cr 64 Approximately 1 Mile, Subdivision Is On The Right Just Past The Dog Ranch. Kitchen Dimensions: 12&apos;1" X 10&apos;7"
Master Bedroom Dimensions: 13&apos;1" X 14&apos;7"
Selling Office: Local Property Inc.